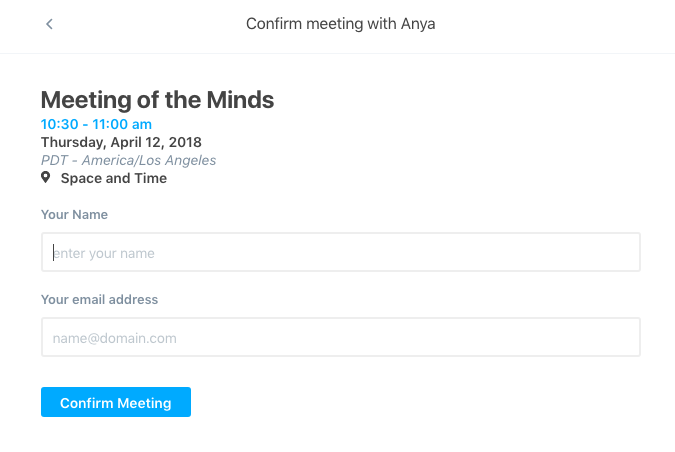 Polymail Calendar Scheduling lets you share your availability and let people book meetings and events directly within your calendar. This feature is for Gmail and Outlook users - we do not support IMAP calendars. You'll go to your Settings in Polymail Web or our Mac app and click on the Calendar tab in the left side bar. Here you can configure your Calendar Scheduling options. Once you've set your Polymail calendar link, you will want to save that change by clicking the blue Save button in the top right corner. If you need to copy your URL in the future, you can click the Copy URL button in blue to the right of your calendar link. 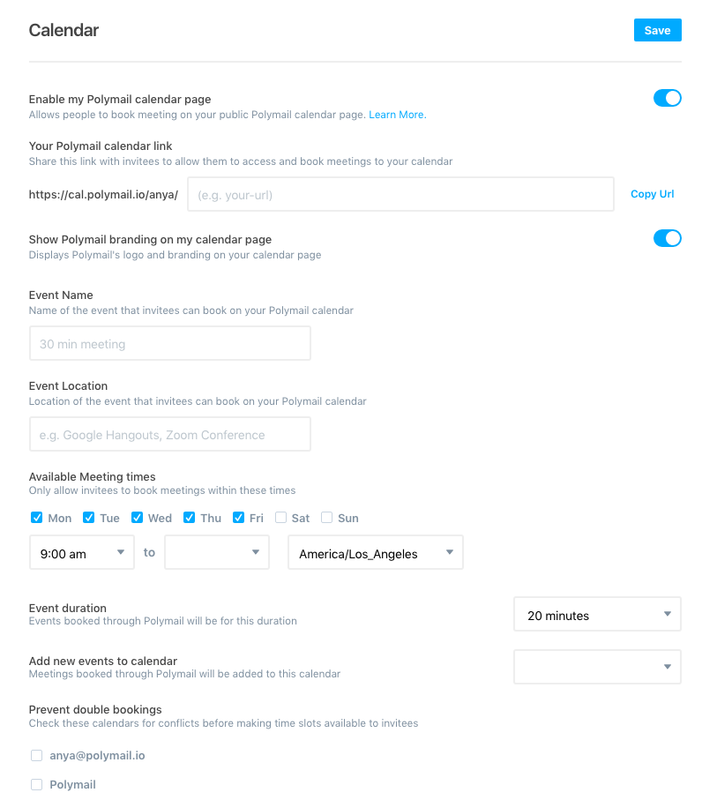 If you are a Team or Enterprise user, you can disable Polymail branding on your Polymail calendar. Pro users will not be able to do so. You can specify your event names. For example, you could title them "30 min. meeting," "Conference," "Skype chat," etc. This will appear on both your calendar and that of the person booking the event. This will let the person booking your meeting know where your event will be or how it will take place. If you're meeting in person, you can specify your office or meeting place. If this is online, you can give them a heads up with something like "Google Hangouts" or "Skype," etc. You can specify which days and which hours of the day you are available to meet. Any times outside of the slots you specify here will not be available to select by the person viewing and booking from your Polymail calendar. You can also specify your location to prevent confusion over time zones. Here you can choose how long your time slots are. We have a minimum length of 20 minutes and a maximum of 1 hour. If the person booking needs more than 1 hour, they can book multiple slots. Polymail automatically pulls your calendars from the email addresses you've synced to your Polymail account. With this option, you can select which of your synced calendars new events will be scheduled to. For example, I have two calendars synced. I can choose whether I want new events booked to my personal work calendar or my company's work calendar. Want to make sure you're not over-committing? 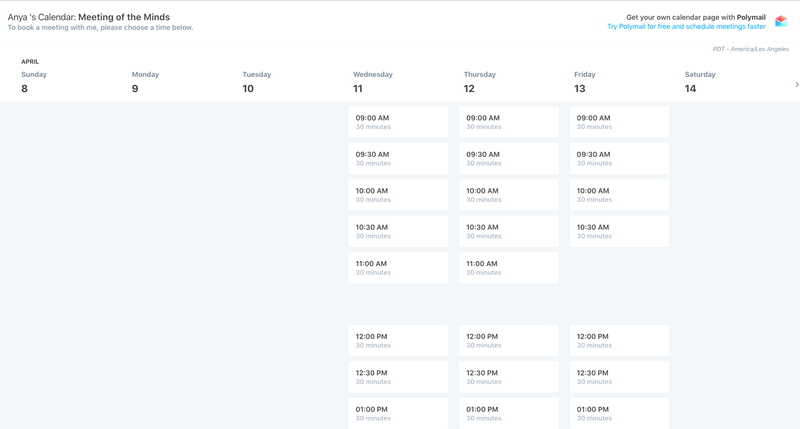 Polymail can automatically check your calendars before letting people book time slots that have already been taken. This option will automatically block out any time that you've already committed elsewhere. The white slots are available to be booked. Anything in grey is unavailable. We make the next 90 days viewable and available for booking. You will both receive confirmation emails and the calendar event will automatically be added to your calendar. The person booking the appointment will be asked to accept or decline the invitation.